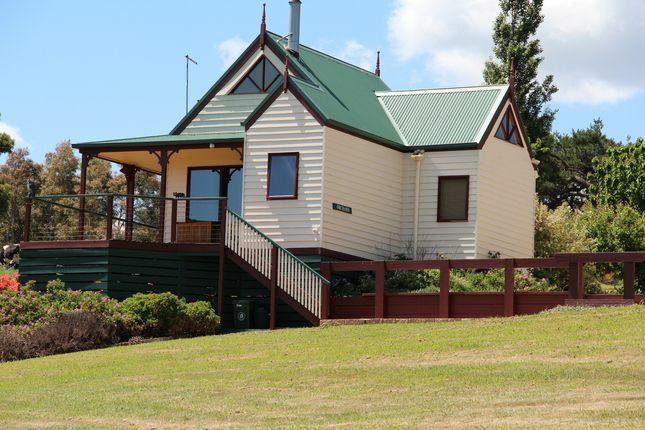 Located in the lush green valleys of South Gippsland, between Wilsons Promontory and the rural townships of Mirboo North & Leongatha, Loves Lane Cottages sets a benchmark in luxury self contained accommodation. Comprising 4 individually designed country cottages, each giving the sense of being transported to a fairy tale time and place, our promise to you is a memorable stay, no matter what the season. Set on 5 acres with extensive gardens including water features, dam, gazebo and seating areas, well equipped gym, sauna, centralised BBQ shelter and solar heated pool, Loves Lane gives you the perfect place to rest after a day out exploring the area. There are 4 Cottages available at Loves Lane and all have all the highest quality creature comforts you would expect in 4 star accommodation. Linen & bedding is supplied as well as everything you need in the kitchen. All weather situations are catered for with cosy Wood or Gas Log fires, reverse cycle air conditioners and ceiling fans. Each cottage is very private and has stunning views across the hills and valleys. Each cottage has it's own private outdoor table setting on the veranda providing another opportunity to take in the countryside. Two of our cottages, the ORCHARD and the SUNSET have spa baths suitable for 2 adults. Our newest cottages, the North and South VALLEY VIEW Cottages have their own verandas, luxury bathrooms overlooking the hills and are fitted with all modern luxury appointments. The entertainment system in each cottage will let you watch your favourite movie or show on a big screen HDTV or listen to your CD's with full surround sound. A PlayStation 3 or similar is also connected to the system which has the added benefit of playing Blu ray discs.....AND we have a huge range of movies that you can borrow at no extra charge. We also carry a small range of games and books for cosy days by the fireside. This one is spacious and open plan with one queen size bed sleeping 2 people. The kitchenette is fully equipped including microwave, portable electric cook-top, convection oven, electric frying-pan and under bench fridge. Open plan in design with a separate bedroom. There is 1 queen bed in the open plan area plus another queen bed in a separate bedroom sleeping 4 people in total. The kitchen is fully equipped including a large fridge, electric oven and gas cooktop. Sleeping up to 6 people with two separate queen bedrooms, 2 single bunk beds, a central lounge room, separate kitchen and dining. The bathroom is luxuriously appointed with cast iron bath and large windows overlooking the valley below. Gas Log fire place and aircons throughout. This cottage also has disabled facilities, such as ramp access, large door openings and separate bathroom (closed off if not required). Sleeping up to 4 people with two separate queen bedrooms, a central lounge room, separate kitchen and dining. The bathroom is luxuriously appointed with cast iron bath and large windows overlooking the valley below. Gas Log fire place and aircons. We have a large range DVD's at no extra fee and each cottage has a Play Station 3 or XBox 360. We have a small selection of games that are available to borrow. Boardgames: A few games are provided in each rooms and another small selection of the classic games are also available to borrow. Could recommend this to everybody. Will go there again. Stunning views at these beautiful cottages, everything well thought out, had a great stay and would recommend to anyone. Loves Lane Cottages is breathtaking. Beautiful English country cottages overlooking rolling hills. Very quiet, cottages are excellent inside with all creature comforts. Nothing overlooked. The small lake and gardens are lovely. The views and pure indulgence of having everything ready when you arrive including, home made bread. quiet, clean, the scenery was great, and over all was the perfect place to unwind. Quality of accommodation was 100%, one of the best, value for money, friendly owners overall excellent. Will be back again for sure. Fanastic!